mono-land / colour-sea is an experimental video inspired by a personal experience of migration, inbetweeness and displacement. 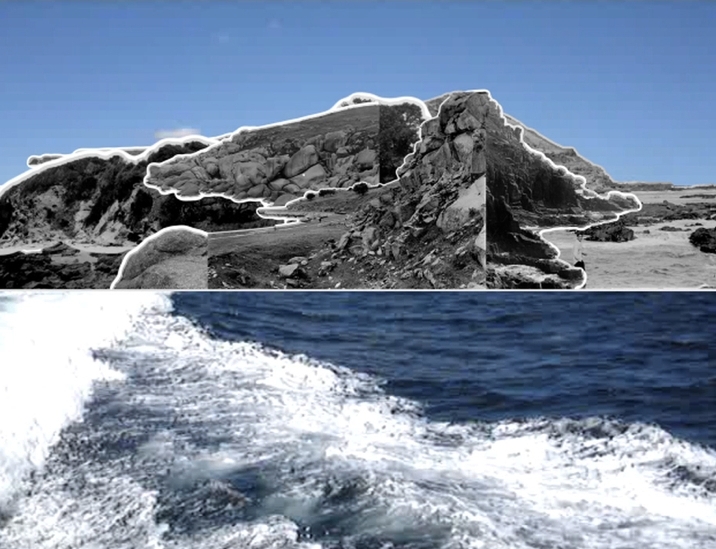 A coastal landscape made from found photographs is overlayed on a video capturing the rough movement of the ocean. The technique of placing the mono photographic images on the colour moving image is a visual combination that parallels a personal experience of migrant identity and duality of the self: mono/colour, still/moving, land/sea, homeland/diaspora. The video content captures the direction of the sea, moving away from the collaged landscape—this is reminiscent of leaving the homeland. Halfway through the piece, the direction of the sea shifts to moving towards the collaged landscape—this is reminiscent of journeying to a new destination. Both simple directional movements across seas are culturally significant and historically familiar in the formation of new identities and nations. The accompanying soundtrack is made up of recorded family dialogue conversing about personal experiences of relocation and the effects of migration.